The Advent Eclipse E300 may have an exciting name, but this budget ultraportable is rather bland, despite a strong display and good usability. In order to keep the price low, a generic chassis has been used to. With a plain black interior that's almost entirely featureless, the red lid does add some colour, but isn't quite as stylish as the Samsung R530-JA02UK. For the most part, it's a solid chassis, with only a little flex around the touchpad. However, the screen only tilts back 45 degrees from vertical, making it tricky to find a comfortable viewing angle at times. Thankfully, the textured keyboard is much better, with firm keys and decent travel that make for a comfortable typing experience. There's no numeric keypad due to the smaller chassis, but there's enough room for a generously sized touchpad which is perfectly responsive. The 13.3-inch screen is quite small in comparison to some similarly priced rivals, but the resolution is the same, which means you get a sharper image. Brightness is lacking, however, with the display being quite dim - although not uncomfortably so. This is also easily one of the slimmest laptops at this size one of the lightest at just 1.8kg. Sadly, the battery life is poor at just 152 minutes, so you'll have to pack the charger on trips. Performance isn't any better, with the budget Intel Celeron processor providing the worst scores in our benchmarking tests. There's enough power for simple office functionality, such as typing up documents, browsing photos and surfing the web, but anything more is going to be a strain on the system. The same goes for the integrated GPU, which is fit only for the most basic multimedia tasks, like the Lenovo IdeaPad Z560 and PC NextDay ZooStorm 3389-9209/B. Light photo editing is fine, but the likes of gaming and video editing are beyond this laptop's limits. The Advent's compact chassis may be portable, but there's also not much room for ports and other features. You'll find three USB ports for attaching peripherals and a VGA port for connecting an external monitor, and little else. 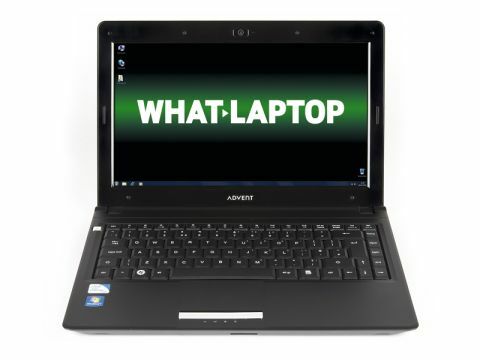 There's no optical drive, unlike a lot of other ultraportables, although networking is decent with 802.11n Wi-Fi and 10/100 Ethernet available for wireless and wired connectivity. While the Advent Eclipse E300 is one the slimmest and lightest laptop of its size, the poor battery life reduces portability. Usability is strong, and the screen sharp, but the bland chassis and blander performance make this a hard laptop to recommend.